BBC NEWS | UK | How does a hedge spark so much hatred? How does a hedge spark so much hatred? Many feuding neighbours will be delighted that new legislation could give local authorities the power to help settle hedge disputes. Campaigners estimate there are about 100,000 ongoing disputes around Britain over high hedges, but a loophole in legislation has so far left local authorities powerless to help. Since May, at least two men have died after arguments involving disputed hedges. One man suffered a heart attack after a fist-fight allegedly erupted, and 66-year-old George Wilson was shot in a quiet Lincoln street following an argument with his neighbour over a hedge. So what drives otherwise rational people to fight over garden plants? Cary Cooper, Professor of Organisational Psychology at Lancaster University, think it is an issue of territory. "Fortress mentality can make people obsessive about territory - to protect your habitat is a basic survival instinct. "If a person feels as though somebody is intruding upon their land, they will want to defend it." Talk to your neighbour. Make notes about your complaint, so that you don't forget any of the things you want to say. Take someone with you if you are concerned about your safety, or take a mobile phone and tell someone where you are going. Write a letter to your neighbour, outlining your concerns. This can also later be shown to the authorities to prove you have tried to tackle the problem. Record incidents in a daily log. Go to your local authority. If your council cannot help, you may have to take private legal action. Ask the Citizens' Advice Bureau and a lawyer for guidance. Professor Cooper also attributes this obsessive behaviour to the threat of financial insecurity. "A person's home is often the biggest investment they make. People are disturbed by anything that might impinge on their property value." For Hilda Harris, a prize-winning gardener from Salford, the issue is much simpler. She says towering hedges on neighbouring property cast a shadow on her garden which makes her hobby near impossible. "I've been a keen gardener for more than 50 years, but new neighbours have allowed their hedgerows to grow taller than my house, which makes it difficult to grow anything at all. "My greenhouse is permanently starved of sunlight and now the trees are leaning on my shed. "I can understand if they want privacy but we can't reach a compromise. We just argue and I don't like confrontation." 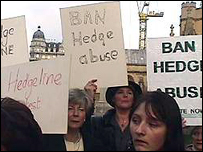 Mrs Harris is a member of Hedgeline, the national lobby and support group for the victims of high hedges. Spokeswoman Clare Hinchcliff says conflicts often spiral out of control because there is no recourse under law. "It's a case of one neighbour having power, and one being helpless," she explained. 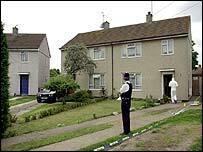 "The victim can't even touch an offending hedge without risking prosecution, even if it towers above their house." Parliament has been trying to legislate against high hedges for some time. Existing common law rights entitle people only to cut overhanging branches back to the property boundary line and do nothing about hedge height. Under new legislation as part of the Anti-Social Behaviour Bill, local authorities could issue formal notices instructing the reduction of tall hedges and enforcing long-term maintenance. Yvette Cooper, minister for regeneration at the Office of the Deputy Prime Minister, said: "It is far better that disputes between people are resolved amicably. "This [legislation] is great news for high hedge victims all over England and Wales and will hopefully bring an end to their suffering." While there will no doubt be smiles for thousands of war-weary neighbours, Professor Cooper is not convinced that hedges are always the root of the problem. "If a relationship is bad with a neighbour for any reason, hedges or boundaries can simply be vehicles for revenge. "When one dispute is resolved, many people will look for something else to fight about. After a while the issue becomes irrelevant." But for Clare Hinchcliff, who has campaigned for six years against nuisance hedges, it is the end of a long fight. "The victims of high hedges have waited a long time to hear this. Hedge bullying will now be clearly labelled as what it is, anti-social behaviour."